This morning we visited the F.A. Seiberling Nature Realm property of Summit Metro Parks. It's a beautiful, 104-acre property preserving natural plant and animal life of the area. It's also at the north end of the Akron metropolitan area. Always a surprise and pleasure to see not only green space but forest land preserved so close to a city. We chose to take one of the hiking trails on what is now, for us, a regular event: a photo walk. The rolling 1.3-mile Seneca Trail took a while to cover as we would walk a bit, stop and photograph something or other, walk some more, stop and photograph… well, you get the picture and, of course, we got lots of 'em. At some point past the half-way mark I spied a bright object floating in a clearing between trees. At first I thought it was a brightly-colored autumn leaf caught in a spider web. Nope, it was a spider hanging from a high, vast web and it was a very large spider at that! Fortunately I had been using the nice macro lens on my camera so I was able to step right up and try and photograph the colorful beastie. I don't really want to know how close I was to this one. It was very large and, appropriately enough for the approaching Halloween and harvest sesaons, bright orange like a pumpkin! As I attempted to shoot close-ups of the hanging spider it apparently figured the giant a few inches away might be a threat and began lowering itself to the ground and the bed of autumn leaves below. Between the necessary manual focussing, wind, and a determined escape plan, I was only able to squeeze off two shots and only one was in good focus. Spidey dropped to the ground and headed into a tent of curly tree leaves. I couldn't just give up so I crouched down on my knees and elbow to spider-eye level to get some more shots. The spider, now ensconced in a leaf tent, held still for my new attempts at a portrait. I got several shots, a couple of good ones, and my favorite of the bunch is shown here. My, such pretty eyes you have… and so many of them! 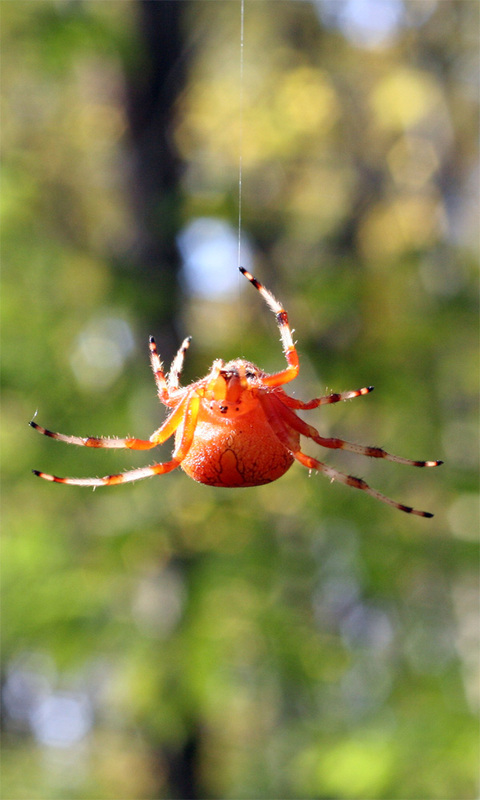 By the way, for those who may be interested in such details, our arachnid friend is an Araneus marmoreus or Marbled orb-weaver. Some may, however, refer to the commonly-heard names: "creepy crawler," or "eeeeeeek! " The autumn woods were looking, feeling, smelling, and sounding of the coming onset of winter. Everywhere there are lovely leaves on the ground and the trees are looking naked. There was a definite chill in the air and blustery winds that reach to the understorey. The sweet smell of decaying leaf matter hangs in some areas, strangely not everywhere. And bird calls are becoming less common with less variety, the whole woods are quieter. Our trail exited into a beautifully landscaped garden area with water feature near the park entrance. Looking at the surface of the water I was taken by a tiny surprise, actually thousands of little surprises. I don't know why I hadn't considered that tiny aquatic plants might change leaf color with the seasons just as readily as the large terrestrial variety. 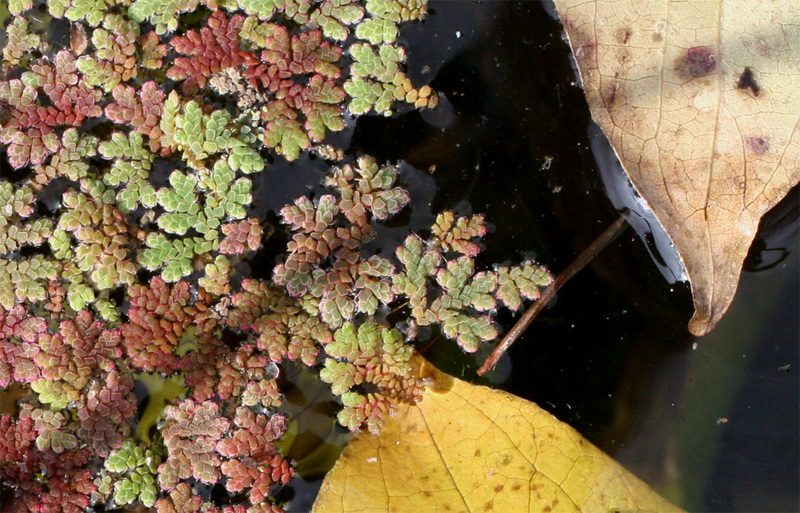 There, floating on the pond, were miniscule, square plant leaves in colors ranging from green to red, all beautiful on the syrupy-looking dark water. We're sure to visit Nature Realm again, perhaps soon, having added it to our short list of favorite nearby places. I really enjoyed reading this – it felt as if I was there. 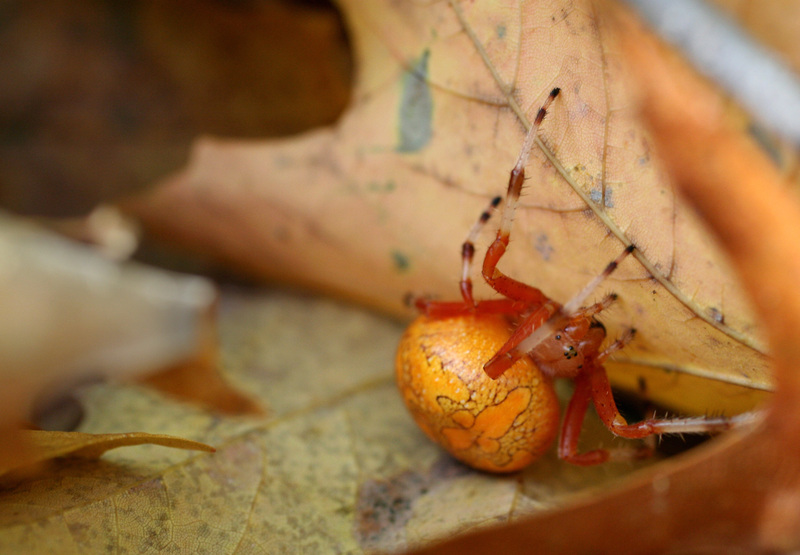 That spider is an amazing colour – it really does look as though it is related to a pumpkin! Your persistence paid off in a great photo. The spider is quite beautiful. Just don't show it to Rachel! The water/leaves photo is really quite lovely.